The plan is led by the Dementia Action Collaborative (DAC), a group of partners committed to preparing Washington for the growth of the dementia population. Priorities for the DAC include creating a “roadmap” to guide caregivers, education for providers and ensure greater access to services and support. 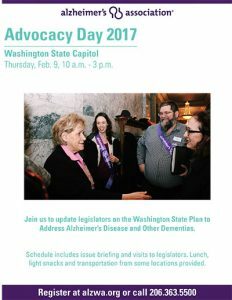 Registration is open for the Washington State Chapter Advocacy Day Thursday, Feb. 9, 2017 from 10 a.m. – 3 p.m. On that day we will be updating legislators on the important work of implementing the Washington State Plan to Address Alzheimer’s Disease and Other Dementias. Schedule includes an issue briefing followed by visits to legislators. Lunch, light snacks and transportation from some locations provided. For questions about Advocacy Day contact Peter Newbould: pnewbould@alz.org or 206-529-3867 or call 206-363-5500.